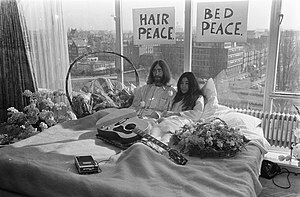 It was fifty years ago today- Tuesday March 25, 1969- just days after being married on March 20th- knowing the publicity the marriage was receiving- took advantage of it by staging a ‘bed -in’ for peace at the Hilton Hotel in Amsterdam. They would spend a week in Room 702 of the Hilton inviting the world’s press to come in and visit from 9am to 9pm. No one really knew what to expect from these two- but when the press visited all they found were John and Yoko wearing their PJ’s- and talking about peace. This was the Vietnam era of course and John and Yoko had long before come out against the war. There would be a second bed-in- in Montreal in May- this is where the Give Peace A Chance single would be recorded.